A formal evaluation of the Fútbol para la Vida HIV/AIDS prevention education program was recently completed by Zak Kaufman of Dartmouth College. Zak developed the FPV program in the Montellano region of the Dominican Republic together with the communities of Saman, Batey Caraballo, and Cabarete, and is currently working for Grassroot Soccer on various capacity building projects. The following is an abstract summarizing this research. Background: The Dominican Republic´s HIV epidemic is disproportionately concentrated in bateyes, predominantly Haitian communities, where prevalence rates are five-times the national average. This study evaluates an adolescent-targeted HIV prevention program in six bateyes in order to determine whether it significantly improves adolescents´ HIV-related knowledge, self-efficacy attitudes, and personal communication patterns. The Fútbol Para la Vida (FPV) program uses Grassroot Soccer´s sports-based HIV prevention and life skills curriculum, which has been shown effective in Zimbabwe, Liberia, Sudan, and Ethiopia. Methods: From July through December 2007, structured interviews were conducted with 139 adolescents (65 females; 74 males; mean age = 13.8 years) prior to, immediately following, and four months following FPV interventions. Within this sample, 98 adolescents made up the intervention group, while 41 made up a matched control group. Participant Observation was conducted during five programs, each consisting of ten hours of instruction. Additionally, in-depth interviews were conducted with Trainers and local HIV/AIDS experts. 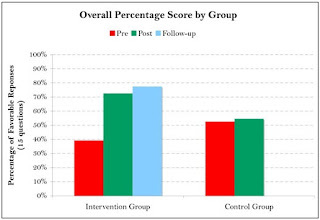 Results: From pre to post, the intervention group (n=98) significantly improved on responses to six HIV knowledge questions (t=13.80, p>0.0000) and three self-efficacy questions (t=11.22, p>0.0000). Moreover, the proportion of participants who reported speaking with a friend or family member about HIV increased from 35 to 56 percent and 24 to 53 percent, respectively. With few exceptions, these improvements were sustained over four months. No significant improvements were found for the control group (n=41). Quantitative data, participant observation, and in-depth interviews all suggest that the sports-based model is optimal for adolescents aged 12-14. See figure below for overall correct response rates by group. Conclusions: Following parti-cipation in the FPV program, adolescents report feeling greater control in protecting themselves from HIV, while demonstrating greater knowledge about HIV transmission, testing, and risk reduction. Communication data suggests that adolescents’ new knowledge is being shared with both family members and friends, such that the programs influence extends beyond the individual participants. This study suggests that the Grassroot Soccer curriculum could effectively become incorporated into larger-scale prevention programs in the Caribbean.